Knotted Climbing Rope - 10' x 1.5"
Knotted Climbing Rope - 15' x 1.5"
Knotted Climbing Rope - 20' x 1.5"
Knotted Climbing Rope - 25' x 1.5"
Knotted Climbing Rope - 30' x 1.5"
Knotted Climbing Rope - 40' x 1.5"
Rogue’s Knotted Climbing Ropes are highly recommended for training young or inexperienced rope climbers, as a series of large knots—spaced 16” apart—provide an extra grip surface for setting both the hands and feet, while also reducing the dreaded palm burn when sliding down the rope. 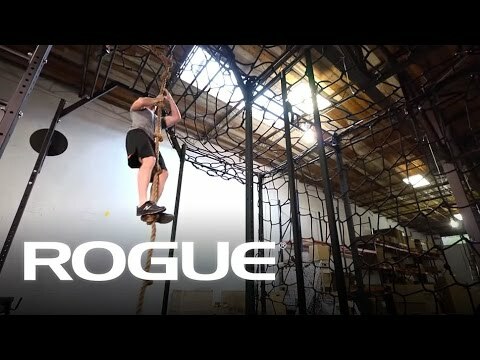 Scaling a knotted rope is generally easier and safer than climbing a traditional gym rope, but it’s still an effective method for improving upper body strength and endurance. Made in the USA, these hand-crafted 1.5” diameter ropes offer the same reliable grip and durability that’s made the classic manila rope a staple of military bases and shipyards for decades. They are available here in five different lengths (15’, 20’, 25’, 30’, 40’), and are designed for indoor/outdoor use. Important: No climbing rope should be used without accompanying landing pads / mats. See more critical Product Safety Information.